Last weeks near collapse of the worlds financial system that was brought home to British voters and labour party members on a near daily basis with an ever increasing meltdown being observed as Britain's biggest mortgage bank HBOS teetered on the brink of nationalisation, has to all intents and purposes brought the risk of an imminent leadership challenge against Gordon Brown to an end, this despite all of the protestations from the growing labour rebels who will fail to bring down their leader, but are succeeding in destroying any chances the Labour party has of winning the next election as the voters despise disunity within political parties. a. Sunday Lehman Brothers (worlds 4th biggest Investment bank) Bankruptcy. b. Monday - Merrill Lynch (Worlds 3rd biggest investment bank) Takeover by Bank of America. c. Monday - The start of the hedge fund attack on HBOS. d. Tuesday - AIG, worlds biggest insurer bailed out at a cost of $85 billion. e. Wednesday - HBOS taken over in the wake of a share price crash. f. Thursday - FSA announces ban on short-selling of financial stocks until January 09.
g. Friday - United States announces the mother of all bailouts that looks set to print several trillions of dollars to buy up the financial sectors bad debts. In such a crisis climate which despite government actions is NOT going to go away for some time, means that in the final analysis despite all of Gordon Brown's flaws, there IS NO ALTERNATIVE LEADER to see Britain through the crisis, neither on the Labour side or in the Conservative party. Therefore Gordon Brown, against all of the odds up to the start of last week now looks set to lead labour for at least another 12 months and probably into an 2010 election defeat. Where ironically any recovery in the economy and stability brought to the financial system will actually work against the Labour party. 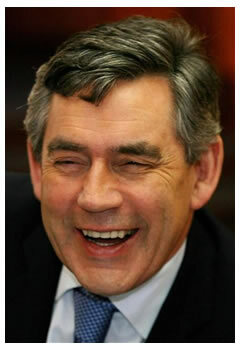 The labour party conference will see Gordon Brown playing on his competent handling of the impact on Britain of the global credit crisis and will increasingly be seen publicly in the front line with his Darling Chancellor destined to be reshuffled out of government given his hand in attempting to bring Gordon Brown down. Still Gordon Brown is not completely out of the woods as Britain enters a deep recession later this year, which will see the electorate suffer for the whole of 2009 and could yet trigger an leadership election by the end of next year.